While Ryan is hiking the Pacific Crest Trail (PCT) this summer, I am going to come out and visit him along the trail in California, Oregon and Washington. He is hiking from the Mexican Border to the Canadian Border, over 2,500 miles and he will be away from home for about 6 months. This month, I got to meet with Ryan at Warners Springs, CA. There is a resort there and not much else, but what a resort! You don't need anything else. About an hour and a half drive outside of San Diego in rolling hills, the resort was once a stagecoach stop between New Mexico and Los Angeles. Because of the hot springs here, there have been settlements at this spot for hundreds of years. Kit Carson even lived here for a while. Now there is a Spa, horseback riding, golf, tennis, hiking, cycling and sky sailing. We had our own cabana on the property and it had a fireplace! Especially nice when those temperatures drop at night here in the desert. The cantina was super cute with these wonderful murals on the walls of cowboys and dance hall girls. One corner had an image from the folk song, The Preacher and the Bear! The pools are fed with water from the hot springs. The "Hot" pool was around 104 degrees and the "cool" pool was 87 degrees. 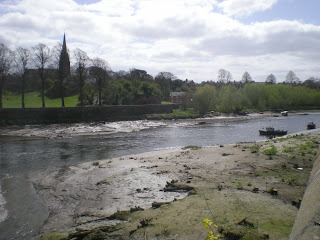 There is a bit of that sulfury rotten eggs smell, but the water feels so delightful, you can overlook that. The first day I was here, I dropped Ryan off for a bit of hiking. We call it "slack-packing". This is when he hikes the trail with only a day pack and doesn't carry his fully loaded PCT pack. He hiked about 10 miles on this day, while I went to the Spa and generally enjoyed myself around the resort! The next day, Ryan took a "zero day". 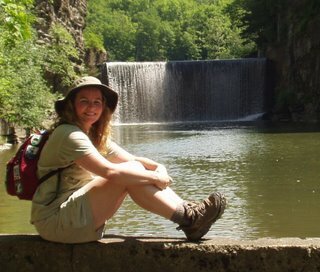 A zero day is a day when a thru-hiker takes a break and doesn't hike at all. Zero miles are logged on a zero day. But what Ryan lost in hiking miles, he made up in air miles. We decided to go on a Glider Ride! 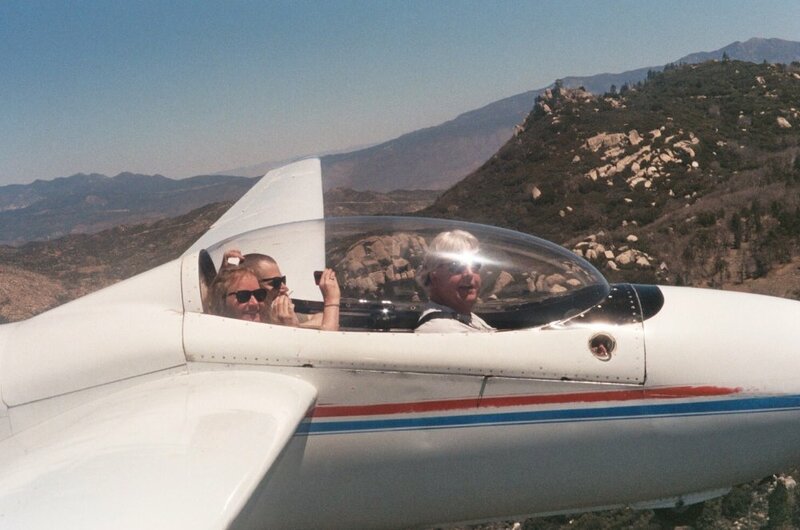 It was a perfect day, not a cloud in the sky and we had a terrific time in the air. Well, I had a terrific time. 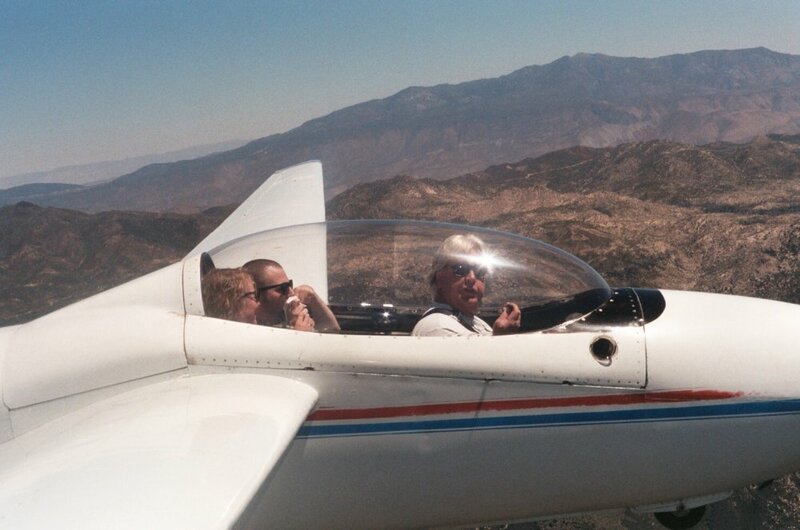 Ryan enjoyed the view, but the turbulence of riding the thermals was a bit much for his stomach. He started throwing up about 5 minutes into the flight and he didn't get any relief until his feet were back on the ground. What a trooper! Instead of going down early (we had already paid for a full flight), he stuck it out and we stayed in the air the full amount of time to enjoy the view of the PCT from the air!! Ryan's appetite was better that evening. After a dip in the pools fed by hot springs water, we had a wonderful dinner at the lodge. I wish every time I came out to meet Ryan on the PCT, we could have adventures like these! Volcanic Ash Cloud Grounds Aircraft! You've got to be kidding me. I totally thought it was a joke. I had had a uneventful layover in Manchester, UK and I woke up that morning and was getting ready to leave when I noticed a plain white sheet of paper had been placed underneath my hotel room door. It said that "Due to a Volcanic Ash Cloud, my flight to Philadelphia had been cancelled until further notice." I thought my other crew members where trying to play a trick on me. 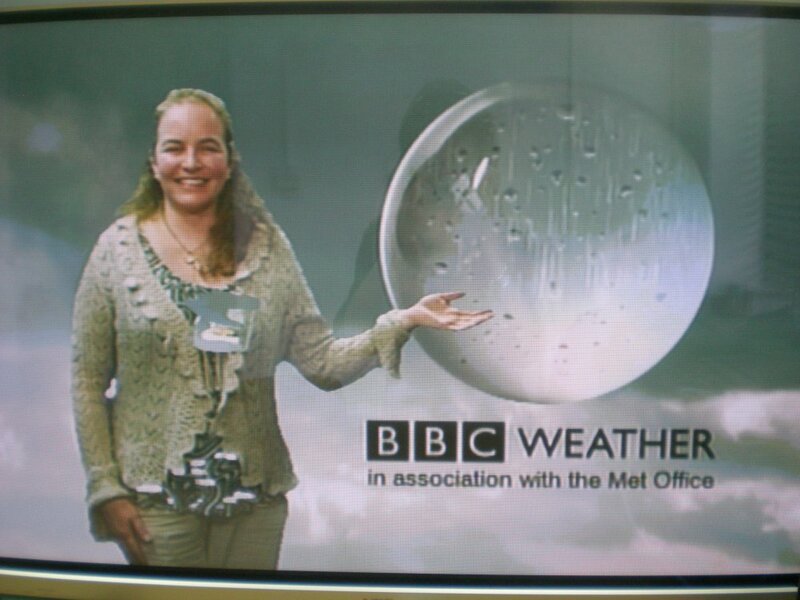 What a great April Fool's joke that would have been!! Only it was true! 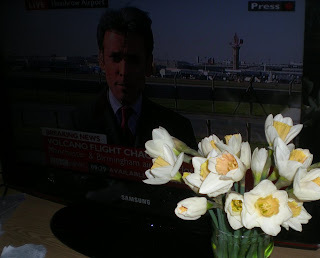 I turned on the TV and there on BBC and CNN were the news anchors showing all the airports in the UK, closed! 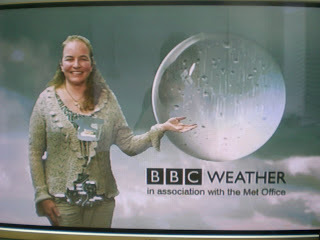 That first day, I stayed glued to the TV, hearing all the reports about the volcanic eruption in Iceland and the dangers of flying thru an ash cloud. The BBC played a documentary about the British Airways flight in 1982 that encountered an ash cloud over the Pacific and lost all four engines! Each day we would watch the local news in England, hoping that the travel ban would be lifted. The weather played a key role. As long as the winds were blowing the ash plume over Europe, we would be grounded. We had no idea how long this could last and were just waiting day by day to see what would happen next. 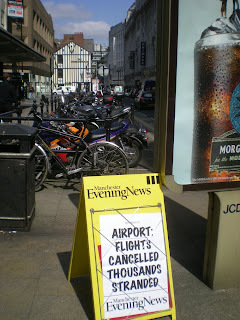 At home things were going along as normal with only the International Flights to Europe being disrupted. But here in the UK, the whole country was stranded. England is an island and the only contact with the rest of the world was now thru ferries to mainland Europe and the Eurostar train thru the Chunnel (Channel Tunnel) linking the United Kingdom with France. 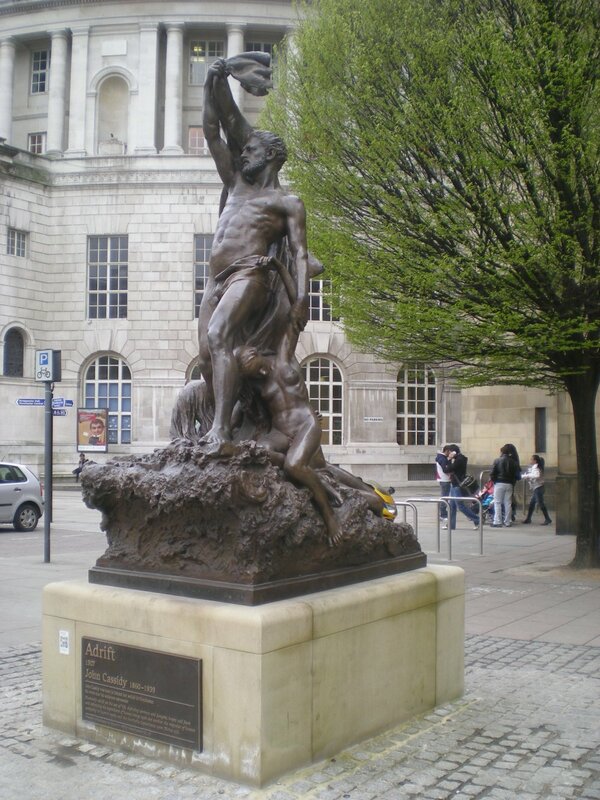 We were "humanity adrift on the sea of life" like this statue, Adrift, by John Cassidy in front of the Library in Manchester. 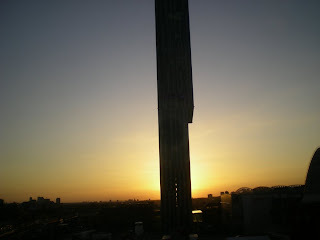 The weather in Manchester was gorgeous. 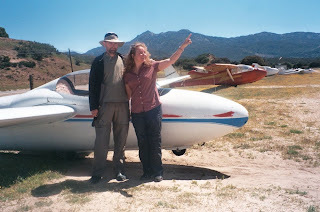 I believe only one day out of the nine days I was stranded was even overcast. Every morning the sun rose bright and shiny in clear skies! 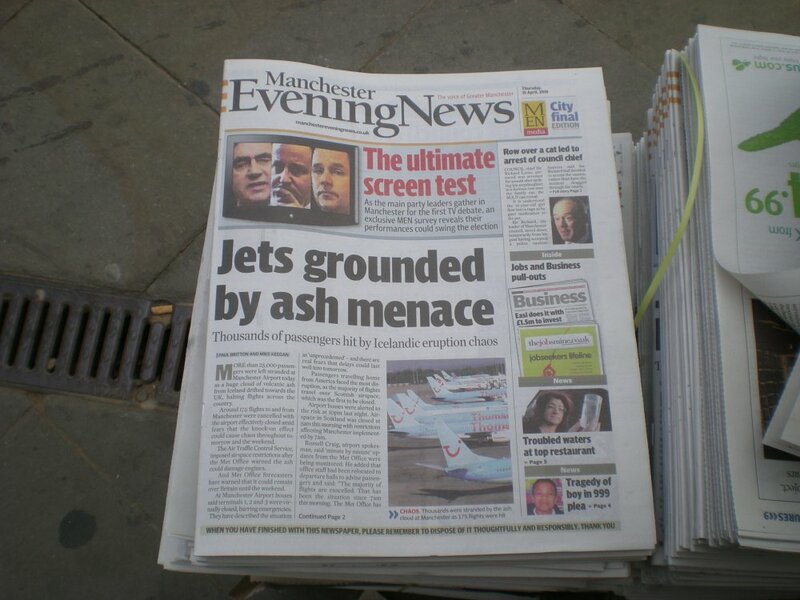 We did not see any evidence of ash, although there were reports that in areas of Scotland and northern England a dusting of ash could be seen. 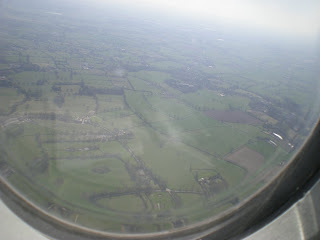 After several days of waiting and watching, I finally decided to get out of Manchester and see more of the countryside. I took a train to the town of Chester. 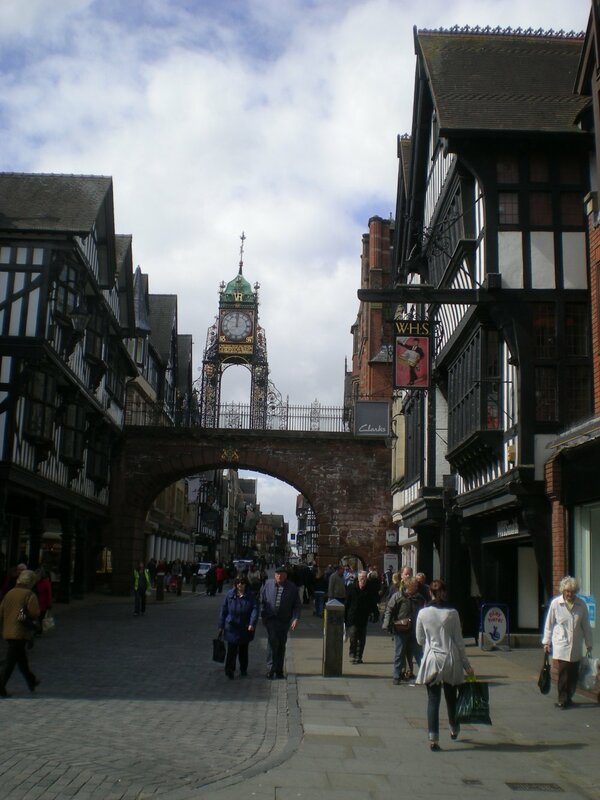 Chester was a Roman Fort in the year 79! and a medieval walled city. Roman remains can still be found in the basements of some buildings and in the lower parts of some of the cities walls. There is also a Roman amphitheater just outside the walls. 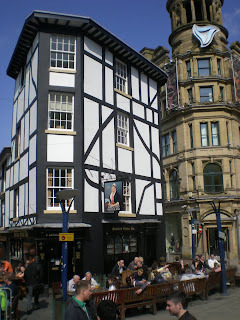 Many of the black and white buildings in the center of the city are actually Victorian reproductions. The walls of the city can be walked and it is a 2 mile circuit. The location on the River Dee made it a key port during the industrial revolution. 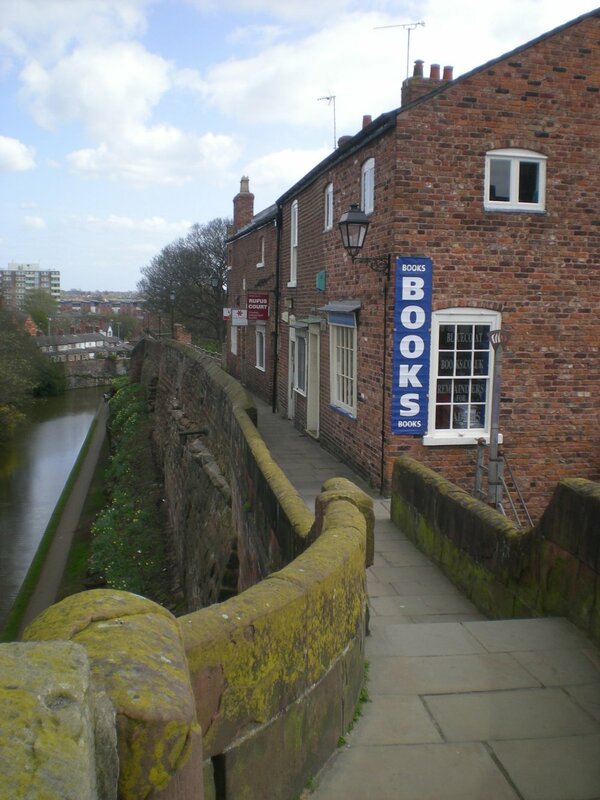 Chester was a transportation hub for the railway and for a canal system. 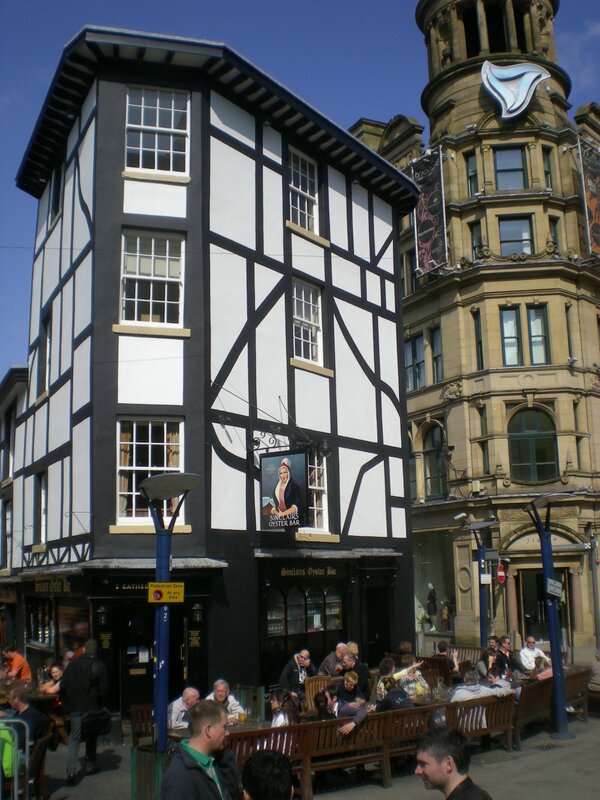 It is really a super cute little city with wonderful history, shopping and restaurants. 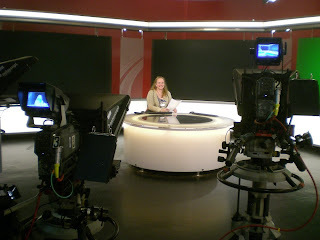 On another day, one of the other flight attendants and I decided to tour the BBC studios in Manchester. The studios are very close to our layover hotel and we made arrangements to take a tour. It was much like the tours I have taken of NBC studios in New York City and the Warners Brothers and Universal movie studios in California. 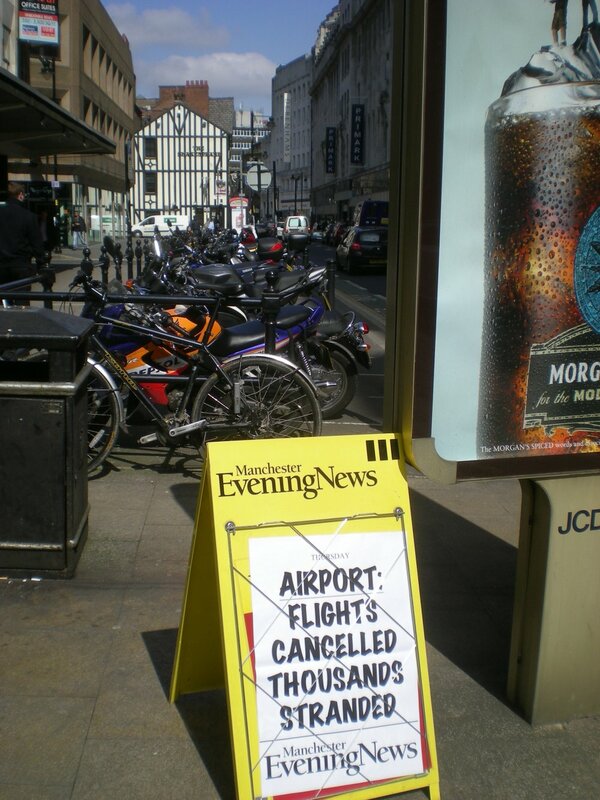 Finally after nine days in Manchester, the travel ban was lifted and the Manchester airport was opened. The flight from Philadelphia was on it's way and we would be working the flight back to the United States the next day! 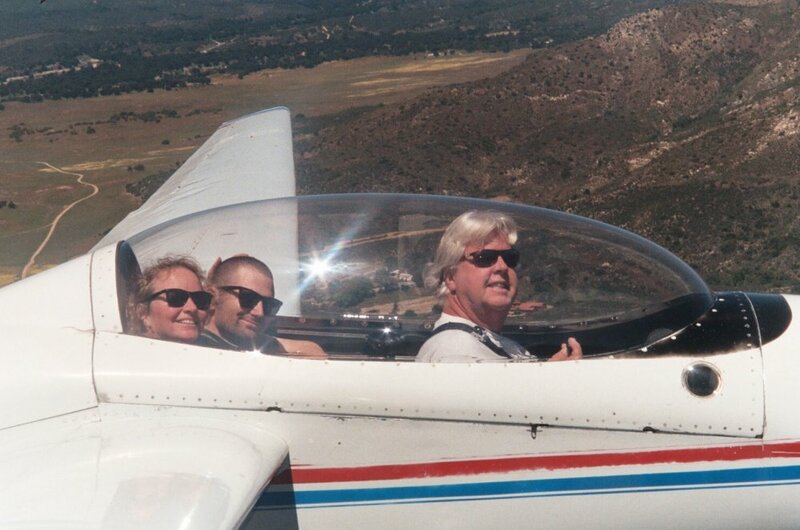 It was great to be back in the air again!